Zach seems to be growing by leaps and bounds and each day brings new adventures for all of us. He will be two years old in June but we have started to celebrate his birthday early because he was so ready for things we planned for his birthday. Zach seems to learn new words every day and he pronounces some of them very clearly. 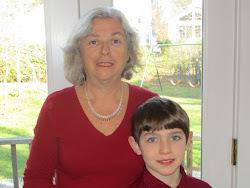 Although I wanted to be Grandma, he prefers “Mamama” so sometimes I will call myself “Grandmama.” I’ll be happy with whatever it eventually morphs into. Zach know his body parts and one of his favorite books is “My Nose, My Toes.” On each page there is a flap featuring a different part - he points to his eyes, nose, ears, mouth, tummy, hands and feet. It is soooo much fun to read this book together. Another favorite book is Hop on Pop. He calls the book Pop and he is very intent as I read the rhymed pages. I think he is beginning to understand the connection between the letters on the pages and the words. To my amazement, he knows the letters on these blocks which originally belonged to his mother. I don’t remember my kids know their letters at this age. All this educational TV must be having an impact on young children today. We planned on getting this table and chairs for Zach’s birthday, but decided not wait and I’m glad we didn’t. This set by Stakmore is the child version of the set we had we were first married. We still have it – it has stood the test of time. From the first day, Zach enjoyed the table and we moved the blocks from our living room coffee table which was beginning to get scratched to his new table in the family room. The padded seats are really comfy - for Grandma and for Zach. We leave the letters scrambled and he takes them one at a time, says what it is and hands it to me. Then I put them in an organized form like this picture. Zach loves doing this at his table and I am still in awe that he knows the letters. He is only 22 months old! Another present that was supposed to be for his birthday was a big boy mattress, but that couldn’t wait either and so Zach has been sleeping comfortably on his new mattress for the last couple of nights. I’ll write about that next week. For now – Please enjoy your Easter or Passover holiday. All of us will be at my cousins’ family for Easter which has been our tradition. Zach is sure to amaze some family members who haven’t seen him for a long time. He amazes me and I see him all the time. Do you have a favorite holiday tradition or recipe? Please share it with us in the comments. I can't believe it but Easter is just around the corner and I have been so busy that I haven't gotten to write this post with such a fun non candy product to offer. My grandson, Zach, loves Dinosaur Train on PBS and his little Buddy plush is a favorite friend. And so, of course, I have become a Dinosaur Train fan too. 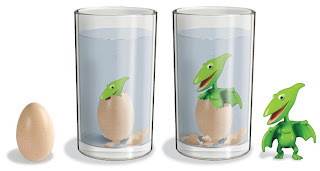 This Jim Henson Company Dinosaur Train "egg hatching dinosaur" is just the thing to help in your Easter celebration with a young child. Introducing Hatchers! from Uncle Milton....... Uncle Milton specializes in scientific themed toys and here is one for children in the ages 3 - 6 range. Mrs. Pteranodon (she’s a dinosaur just in case you didn’t know that) has an egg and you can watch it hatch. Actually there are four eggs that you can buy separately. 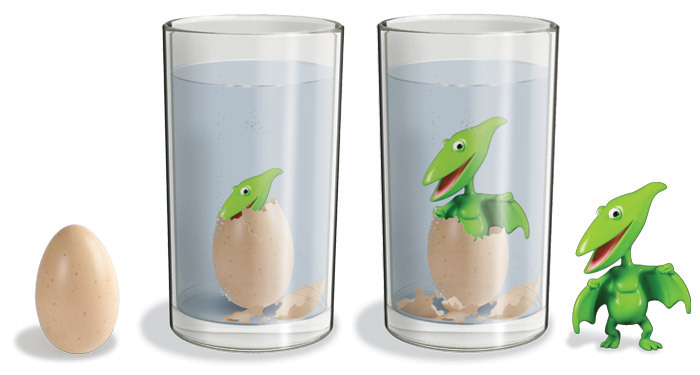 Just put the egg in water and in 1 – 2 days Tiny cracks through the egg and grows…and grows. Tiny then returns to her normal size but grows four times as large when placed in water. This is fun to watch “hatch” and then fun to play with at bath time. This is a lot of fun for $4.99 and Toysrus has a special on it right now. Here is my Dinosaur Train giveaway for all you bakers out there. I know that some of you grandmothers bake - I do. 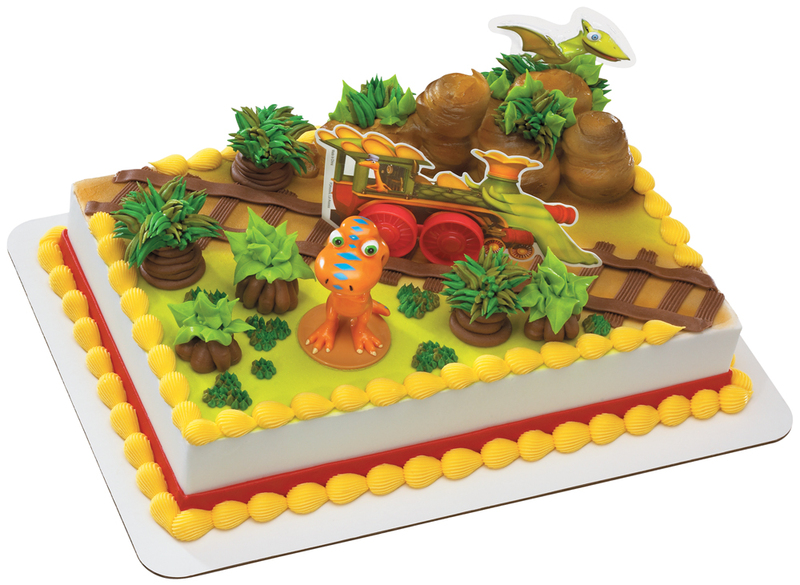 It is easy to enter to win this fancy Dinosaur Train Cake Decorating set and Dinosaur Train Cupcake Rings from DecoPac. 1. Leave a comment by Wednesday, April 20th, 2011 before midnight. You can also follow the Jim Henson Company on Facebook .